Dolphin Water Fountains - Click on an item for more details! 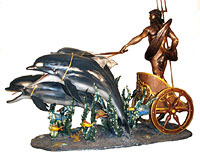 This Large Leaping Dolphin Fountain is made with the finest details and materials. Handcrafted for the highest quality and unique design. A treasure to enjoy in your home or garden to last a lifetime. Bronze, 32 inches W. 49 inches D. x 92 inches H.